Christians in Syria have borne the brunt of much pain and suﬀering in recent years – and yet they continue to hope in God. Our compassion means so much to them, and for this reason ACN is working closely with project partners on the ground to provide urgent assistance including food, medicine and shelter. The Christians there are counting on our prayers and generosity. 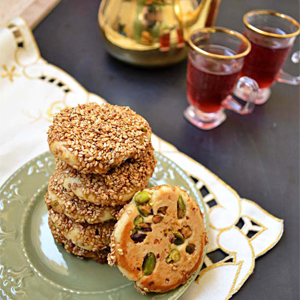 Barazek are traditional Syrian butter biscuits coated with sesame seeds and pistachios. Cream the butter and sugar until pale and ﬂuﬀy. Add the eggs, one at a time and beat well until fully combined. Add the vanilla and vinegar to the mixture. Cover the dough and leave it in the fridge to rest for an hour or overnight. To roll and bake the barazek cookies: mix the sesame and honey on a plate and set aside. Prepare another plate with chopped pistachios. Preheat the oven to 180°C/Fan 170°C. Line baking trays with baking paper. Start by rolling pieces of the dough into walnut size balls with your ﬁngers. Press one side of the dough ball into the pistachios, ﬂatten it a little. Flip the cookie dough and press the other side into the sesame honey mix. Arrange the cookies on your baking tray about 2cm apart. Bake for 15- 20 minutes until the bottoms are golden brown. Allow to cool for a few minutes on a baking tray and then transfer to a wire rack.